Mankind’s first murderer, a weary Cain contemplates the death of his brother, Abel, who lies face down (at right) in this 1944 painting by the German-born artist Georg Grosz. 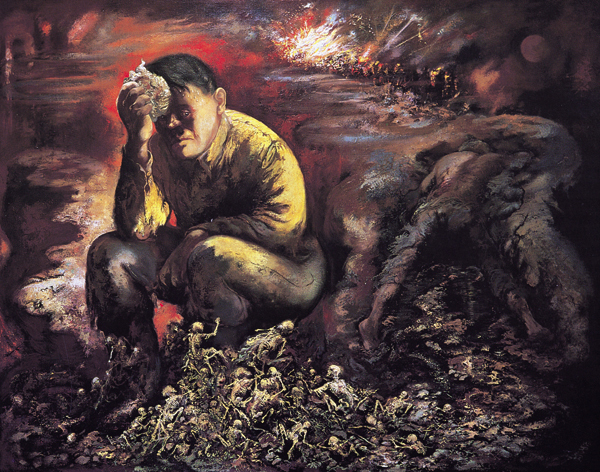 Chaotic skeletons struggle at Cain’s feet in Grosz’s painting, titled Cain, or Hitler in Hell. As Elie Wiesel points out in the accompanying essay, the first death in biblical history is a difficult one, raising questions not only about Cain’s responsibility for the death of his brother, but about Abel’s own culpability and God’s role in the killing. The final lesson, according to Wiesel: Killing a man is killing a brother. Born in Berlin, Georg Grosz (1893–1959) emigrated to the United States in 1933, just a few days before Adolf Hitler took office as German chancellor. Grosz’s paintings present a biting satire of German society, criticizing militarism, blind obedience to political leaders, and moral corruption. Photo: © Estate of Georg Grosz/Licensed by Vaga, New York, NY. Cain and Abel: The first two brothers of the first family in history. The only brothers in the world. The saddest, the most tragic. Why do they hold such an important place in our collective memory, which the Bible represents for so many of us? Mean, ugly, immoral, oppressive—their story disturbs and frightens. It haunted mankind then and still does, working its way into our nightmares. At first we become attached to Cain. He shares with his younger brother, Abel, the generous idea of offering gifts to the Lord. But for this, Abel might never have felt the need to do the same. For reasons the text does not bother to explain, however, God accepts the gift from Abel after refusing the gift from Cain. For the first time in history, death occurs. And the first death in history, it is worth underlining, was a murder. Of course we are angry at Cain. Nevertheless, it is not difficult to understand his resentment, even his rage. But he should have restrained himself. One does not kill an innocent person, and certainly not one’s brother. If Cain wished to reproach someone, he should have addressed God, and not his younger brother. Abel succeeded in winning God’s favor? Cain, the older brother, should have been pleased for Abel! Was Cain unable to control his anger? Well, that is understandable. But to throw himself on his more fortunate brother and kill him! Too much! Read “What Happened to Cain in the Bible?” and “Who Was the Wife of Cain?” in Bible History Daily. Cain nevertheless remains the archetypal murderer. His flash of anger is not enough to make it a crime of passion worthy of extenuating circumstances. If he was justified in holding a grudge, it should have been against God; he was wrong to lay the blame on his brother. Had he cried out to the heavens to express his pain, even to vent his rage, all would have been forgiven. Powerless against God, Cain took vengeance on the only being near him. That was his fault. And his crime. Most people realize that “the world is unfair.” That unworthy people seem to get everything, while very worthy people often end up with nothing but bitterness. In the book of Job, everything that can be taken from a human is taken, and yet in the end he is given no choice but to either curse God or accept his fate and bless God anyway. Cain did not do that, even though he was told that if he accepted his fate and tried to be better he could still be accepted. But he chose vandetta. He chose revenge. His “honor” had been abused. And so God did punish him for the murder he committed, but his physical life was not taken. Instead he was to live and wander with the memory of his crime but was not be slain. He had to live in punishment but to reflect on what he had done wrong, and hopefully repent. He could still be accepted even after all that. The aprons of fig leaves that Adam and Eve made and wore, hid their nakedness but not their disobedience to God. God then gave them animal skins to wear instead. It seems possible that God showed them the sheep being killed, their blood spilled and their skins removed and then they were told to wear them. If there was still blood spattered on the fleeces then these would have been a persistent reminder of how these creatures had to lose their lives because of their sin. Since Adam and Eve were only allowed to eat fruit that had seeds (and not animals) then the reason that Abel kept sheep was probably for the sacrifices that would inevitably be needed when any of the family disobeyed God again. Perhaps Cain was too proud of the work he put into growing their food and decided that was good enough to be offered to God. When God did not accept it but did accept Abel’s sacrifice, Cain drew Abel away from where the family was living and then killed him. So it would seem that pride, jealousy and anger led to Abel being murdered. I believe how to bring this lesson to present day, is to examine the details. Each part is presented to us to learn how things can go very badly. It is a lesson in human dynamics. The Bible makes it clear, though not very easy at times (that is why a through study is required…Prayerfully.) that man has a sin nature, which was passed down from our first parents, Adam and Eve. Sin is a destructive force, and no one can avoid its effect. But I want to know how to relate this story of Caine and abel to our present world today ? Elie Weisel’s article is typical for those trying to justify the guilty and cast blame where it is not due. Another example is justifying Judas because his action was prophesied and he therefore had no choice (re Jesus Christ Superstar). Much of the background to Bible events are not recorded (else we would have a book many time the size it is and end up being an omnibus Mills and Boons) and so concentrates on important events designed for our edification. Similarly so with the who it was Cain married. I don’t think it’s profitable to take some myth or legend of dubious source and turn it into probably or fact. Let’s stick to what are the facts, take them as lessons, and move on. Cain is the archtype of the offspring of the serpent (a liar, a murderer, and cursed, like his spiritual father the serpent). His offering was not of the best that he had, unlike his brother’s). A good man, after being rejected by God, would ask why and reform, but an evil man hates the one who obtained favor instead. Cain gets away with murder (apparently) to force an eschatological interpretation of the curse on the serpent (Abel, favored by God, died because of that favor, while Cain, cursed by God, had his life spared and founded civilization; yet the curse on the serpent implies he is the big loser). This God’s words to Cain, “If you do well, is there not a lifting up,” applied to the one who actually did do well (Abel), means there must be a “lifting up” from his fallen state (death), so that he might receive the promised reward. In Genesis 3, we read that when Adam and Eve sinned, they attempted to cover their nakedness with plant leaves. God teaches them a very important lesson, in that He, God killed one of His animals, and covered Adam and Eve with the skin of the animal. The order is set, the instruction is clear, an animal must die to cover the sin of man, leaves simply were not adequate.God even told Adam that the ground was cursed, and thus the produce of the ground would be similarly cursed. In the age before TV, or Radio, or books or even writing on the walls of caves, how many times do you think that Adam and Eve told their sons the story of how God had provided for their atonement – that it was not of their own works, but of grace. Abel learned the lesson and followed the instruction to the letter. We must remember that the animal that Abel killed was only killed for the purpose of sacrificing to God – Abel – and all man – were vegetarians; so Abel killed the lamb, and drained its blood – probably getting some on him in the process, and then the whole animal was offered by fire to please God and to show until Messiah come the proper covering for our sins. Cain did not learn the lesson. He offered vegetables – plucked from the curse ground, possibly, but not necessarily washed in the waters that had run over the same cursed ground, and offered them to God – knowing he would then, after the service, take the vegetables home and feed the wife and kids with them, that night. I can hear Ms Cain now “you did what with the veges you picked today – you go right back out and pick them up and get them home so I can feed the kids. Sylba [#3] seems to be the one to best understand the issue: without the shedding of blood there is no remission of sin [Heb 9:22.] Abel somehow understood this principle because of Gen 3:21 – Unto Adam also and to his wife did the LORD God make coats of skins, and clothed them. The Lord killed animals to obtain the skins for clothing – and the clothing ‘covered their nakedness’ [sin]. God tried to pacify Cain by saying, ‘If thou doest well, shalt thou not be accepted? and if thou doest not well, sin lieth at the door.’ Cain made an offering of his *works* – which is anathema to the Lord. The rejection of his ‘good works’ is what angered Cain… he could not react in anger against God so he succumbed to attacking his brother in sibling rivalry. Did Cain know that his action would ‘kill’ Abel? We cannot be sure. All ancient cultures understood the principle of the shedding of blood as sacrifice for sin. It seems surprising that Elie Weisel would not perceive this. The reason why Abel was killed is stated in Hebrews 11:4: Cain’s offering lacked the motivation of faith that made Abel’s sacrifice acceptable. It was not that Cain’s offering was faulty in itself; God’s Law later allowed the offering of the produce of the ground. (Lev. 6:14, 15) But the Bible says of Cain that “his own works were wicked.” (1 John 3:12.) Cain evidently thought that the mere outward show of devotion to God was enough. His lack of real faith in or love for God quickly became apparent through his actions. But the problems must’ve appeared long before they offered the sacrifices. When Adam and Eve’s first child was born, they named him Cain, or “Something Produced,” and Eve said: “I have produced a man with the aid of God.” Her words suggest that she may have had in mind the promise God made in the garden, foretelling that a certain woman would produce a “seed” who would one day destroy the wicked one who had led Adam and Eve astray. (Gen. 3:15; 4:1) Did Eve imagine that she was the woman in the prophecy and that Cain was the promised “seed”? What is more, if she and Adam fed Cain such ideas as he grew up, they surely did his imperfect human pride no good. In time, Eve bore a second son, but we find no such high-flown statements about him. They named him Abel, which may mean “Exhalation,” or “Vanity.” (Gen. 4:2) Did that choice of a name reflect lower expectations, as if they put less hope in Abel than in Cain? We can only guess. God’s standards are absolute. He would accept only sacrifice of blood as has been mentioned numerous times in the discussion. Now, Cain, instead of enquiring from either God or Abel, which naturally anyone would if his or her gift is not accepted, is enraged and that too with the wrong person. This passage shows that hatred has little or nothing to do with the person you hate. The Genesis account of Cain and Abel is only an allegory of what is the universal religion: the solar religion, astrotheology. Was the sacrifice of both Cain and Able an attempt to bribe God? Did God ask for some food? Does He eat anything at all? How did Cain know that his sacrifice was rejected? Did the brothers quarrel over something very different such as who had the easier life/work? The story of two original brothers quarreling and one being killed by the other is world-wide: did these stories (with different names and settings) all originate from that in the Hebrew Bible and spread round the world with humans migrating ever further east thousands of years before missionaries? The purpose of history is not to merely teach us what happened but for us to learn a lesson from every item of every stage of human history. The Hebrew Bible is an historical record and also a moral guide which has never been been bettered. If possible, it should be read in the original Hebrew which has been copied accurately in the belief that it is divine and even a single letter may not be altered even by accident. Whether Jesus was or was not divine, he taught Judaism based on the Hebrew Bible and his sayings are from Jewish sources. It was his later followers who claimed that they were original sayings and moved their teachings away from Jewish morality to proclaim and stress the divinity of Jesus. One way to interpret our first reading from Genesis is to see it as a mutiny. From this perspective Cain is not so much jealous of Abel, as enraged with righteous indignation at God’s behavior. Cain’s self image has been wounded, and his prerogatives as the elder, even if it is only as the first of twins, have been threatened. Cain sees God’s regard for Abel’s sacrifice, while having no regard for Cain’s sacrifice, as fickle and capricious. Though God does not reject Cain as a supplicant, nor does he overtly reject his offering, that is of little comfort to Cain, who feels rage as well as shame, a lethal combination. After all, Cain tills the ground East of Eden ,“by the sweat of his brow” like his father, while the sheep are tended to by the “kid” brother. With only the concrete directives given to Mom and Dad by God before evacuating Eden, Cain creatively initiates the notion of offering a sacrifice, For his part, Abel, the classic younger brother, imitates “big brother”. His attempt to outdo his older sibling has a barely noticeable edge of competitive rivalry. The classic pattern of sibling rivalry is set in motion with a vengeance. Cain’s gift may not earn a divine regard, but he surely he is the apple of his mother’s eye. Eve rejoices at his birth, declaring that she “acquired” a man, and names him “acquisition”, Kayin in Hebrew. She offers no comment at Abel’s birth, not even exercising her prerogative to name him. Those, like Cain, who open the womb, often carry the burden of great expectations, and with them a sense of entitlement. Adam is nowhere to be seen; the first father is also the first absent father. And now, Cain has been upstaged in the presence of the ultimate parental figure. With this action Abel quickly moves to his rendezvous with destiny as history’s first innocent victim– wrong place, wrong time – the first example of “collateral damage”. Like most subsequent victims, it is Abel’s very behavior that inadvertently triggers his own demise. And, as has been so true of victims throughout millennia, it is Abel’s very naïve innocence that renders him so hopeless, helpless, clueless, and thus, such an attractive target. One can only imagine the total obliviousness with which Abel follows his brother out to the killing field. He has nothing to say for himself; or about anything else, for that matter. The “silence of this lamb” will become prototypical throughout history. The real drama in this plot, however, is between Cain and God; Abel actually seems little more than a cipher. After the first case of manslaughter or murder, depending on one’s point of view, Cain is confronted by God’s query, “Where is Abel, your brother?” Cain responds, “I do not know; am I my brother’s keeper?” Now the role of “keeper” is an exclusively divine function. Thus, if the pronoun “I” is emphasized, Cain’s rhetorical retort could easily imply that God was the absent parent who failed to protect his creation. Furthermore, due to a Hebrew language that is often maddeningly ambiguous, Cain’s defiant answer could just as easily be translated, “I did not know that I was my brother’s keeper”, thus pleading ignorance. Why did God have regard for Abel’s offering, but not for Cain’s? Multiple reasons have been conjured up by scholars and believers. We feel a palpable compulsivity to find reasons—so as not to contemplate a God who is unreasonable, a God who just might be as fickle and capricious, as his creation seems. Upon pondering that possibility, Albert Einstein once mused: “God does not play dice with the universe. God may be inscrutable, but he is not devious.” Oh, REALLY!!!!!!! Contrary to the notion of primogeniture, where in the first born inherits the manor, God repeatedly has a fondness for younger family members, such as Jacob over Esau, and Joseph and his technicolor coat, and King David, who both had multiple older brothers. Another explanation: God’s preference for the blood sacrifice of an animal over mere grain or produce from the earth. One more: God’s preference for the values associated with the nomadic pastoral lifestyle, as opposed to settled agriculture and its inevitable urban civilization. But the grand daddy of all explanations goes something like this: Abel’s sacrifice was somehow morally superior to Cain’s: e.g. Cain offered “some” of his produce, perhaps leftovers, whereas Abel brought the “first born”, “with fat” mind you. Apparently, this creator God has a craving for cholesterol. This moralistic tendency is basic to the Western perspective on life. But in the end, does the Sovereign of Creation need a reason? After all, as Blaise Pascal once wrote, “The heart has its reasons which Reason cannot comprehend”. Must God conform to human rules of justice and fairness? If the sovereignty of the Creator is absolute, then does not God retain the right to be fickle and capricious? Certainly the story of Cain and Abel presents us with that possibility. It maybe that while Cain was looking for justice and fairness, with its qualities of accountability, predictability, control and security, he should have been learning one of life’s hard lessons: As Karen Armstrong writes in her book “In the Beginning”, “Some people have the gift of inspiring affection and others do not……Unless human beings can bring themselves to accept this early familial injustice and make their peace with it, they will remain fixed in vengeful patterns learned in childhood…We have all felt the bewilderment of Cain when faced with this arbitrary injustice of life”. Cain’s offering was a selfish offering, Cain thought that he knew best to what God wanted and when God rejected his offering Cain sulked and got upset. He got upset because he/Cain didn’t get his own way. This is why God said “Why are you angry? Why is your face downcast? 7 If you do what is right, will you not be accepted?” Cain couldn’t accept the rejection. The offering in itself was wrong but that isn’t the message here. Cain couldn’t get his own way. He then approached Abel probably to see if Abel could see it his way but the outcome suggests that Abel didn’t side with him either. So Cain just like a spoilt brat boiled over and killed Abel. Cain was warned by God saying “But if you do not do what is right, sin is crouching at your door; it desires to have you, but you must rule over it.’” Cain couldn’t let go, he was stubborn and arrogant and thought that he knew what was best for others. Does this remind you of anyone? Anyway, before Cain could control his temper Sin had already entered. What Cain did was to please Cain not God. Cain was only thinking of himself nobody else and when Cain couldn’t get what Cain wanted he didn’t want to listen to what God had said so he ran to Abel for support and when he found out that Abel wouldn’t side with him, Cain became infuriated and killed him. Cain couldn’t get over anyone questioning his actions, he couldn’t handled being told what to do. He wanted to inflict his ways onto others in so doing what’s best for Cain only. If you read what is being said slowly and carefully then you can see what is happening. There is no profit in speculation. Only in reception. What the Holy Spirit illuminates one can hold onto. Best to discard the rest. The concept of what to sacrifice comes from the laws of men, not from the laws of the Almighty. The claim that a sacrifice of a life is what the Almighty requires comes from the laws of men, the commentary, that were created to accompany the commandments. Genesis, remember, was not one of the “Books of Moses” but came later. Rationalizations for the decisions of the Almighty are all well and good but they are only that, we can make up as many stories as we wish but we fall into that other category of the 7 deadly sins, we commit hubris. No one has ever successfully challenged the historical accuracy of the Bible. The Bible writers were honest men who wrote with openness of heart. Their candor gives their writing the clear ring of truth. The Bible has one central theme: the vindication of God’s right to rule mankind and the fulfillment of his purpose by means of his heavenly Kingdom. Although written thousands of years ago, the Bible is free of mistaken scientific ideas that had gained wide acceptance in ancient times. Documented historical evidence proves that Bible prophecies, or predictions, have come true. He, Although He Died, Yet Speaks”Chapter one. ABEL looked at his flock of sheep grazing peacefully on the hillside. Then, perhaps he looked far beyond his sheep to a spot in the distance where he could just make out a faint glow. He knew that right there a flaming blade was turning, ever turning, blocking the way into the garden of Eden. His parents once lived there, but neither they nor their children could enter now. Imagine the late afternoon breeze ruffling Abel’s hair as he turned his gaze upward and thought about his Creator. Would the breach between man and God ever be healed? Abel wanted nothing more than that.Imitate their faith. STORY OF CAIN AND ABEL Prime rib vs Broccoli ? Let us be real people. Who wants to choose a veggie when a prime rib is offered? God with a sense of humor naturally wanted a steak ! Abel was favored. Abel like most of us wanted to please God with the best, fat portion of first born, (can we call it prime rib?) unlike measly tasteless veggie, (can we call it Broccoli?) Cain brought from his garden. Both had the same intention, wanting to please God with an offering. It is hard to understand the literal meaning of this story. I looked at a different perspective to make the story a powerful one with the message on grace, love and forgiveness. We may visualize this whole thing like in a drama. In Part one we witnessed the scene of paradise in the garden. It was about a man and a woman coming to know good and bad in the world. Basically they become self-conscious or self-aware of as soon as they ate the fruit. Bible in Genesis 3 .7 says …” Then the eyes of both of them were opened, and they realized they were naked”. Having known both good and evil Adam and Eve were banished from the garden forever. Bible describes this as man showing disobedience by eating the forbidden fruit. Supposedly they ate because of their free will. Even though Adam and Eve disobeyed God we observe the full expression of freewill or the freedom which is fundamental to unconditional love. Now the curtain reopens. It is Part Two. Acts of sacrifice, offering of an animal or some vegetarian versions are universal ideas. We find this practice in almost all world religions for thousands of years. I am not sure how and where we got this idea. Part of becoming self-aware is to face the fear of uncertainty. The concept of offering to God some food in order to please Him, has somehow pervaded in our lives for thousands of years. This kind of sacrifice is not mentioned in the first three chapters of Genesis. Now, Cain happened to work with the soil, offered some fruits of the soil. Initially he feels an offering is an offering, not so much about how expensive it is. He must have thought well. Abel on the otherhand, working with a flock of sheep wanted to please God with the best high priced gift, fat portion of the first born of his flock! A prime rib I suppose. He really wanted to impress God. He must have thought God was going to promise him the paradise. I suppose greater the gift greater was the reward. In the drama we see God looking with favor on Abel! This has to be a joke. God has to have a sense of humor. I guess God was playing here. Does God really show favoritism? If you ever had a choice of eating a piece of veggie vs. prime rib, what would you have preferred? Prime rib of course! I said seriously it was a joke because we soon see Abel getting killed. How can a favored person get killed? Now good thinking Cain changed his mind and he could not bear God favoring his brother. Soon, like any other human being he got angry. God was not finished with Cain. He knew Cain was angry, he still asked him “why are you angry?” Just to test him. Naturally, Cain became even angrier no different from many of us. Now God said “if you do what is right, will you not be accepted?” Cain did the right thing, but could not accept when he noticed that he was not favored. God went on to say “if you do not do what is right, sin is crouching at your door, it will even possess you. (Remember the quote “Devour the Lion otherwise Lion will devour you!) Here God clearly explains what Sin is. This is not about morality. Sin is when we know fully the “right things” but we do not act according to what is right. In other words sin is when we have the knowledge of righteousness that we can do something to make a difference in human injustice but we do not act on it. We prefer to be stay in the sideline or in the darkness no one can notices us. As we read later we find the religious people at the time of Jesus were very knowledgeable about the scriptures but their life was all about following some laws without any consideration of love or humanity. Jesus called the religious people hypocrites or double minded and even vipers. Andy Stanley puts it how good a sacrifice is good enough? Does the best prime rib in the world cut it? I think God might have enjoyed the meat but Abel’s hard act of pleasing God killed him. Basically Abel was trying to show off and in that very process he was killed. It is very much true in this modern world, we acquire so much material stuff mostly to impress others, to get approved and applauded by others and it is not surprising we get hurt or even killed in such processes. God did not take revenge and kill Cain. Cain did not get punished. Not only that, he put a mark on Cain’s headed so that no one who found him would kill him. He also said that if someone killed Cain that person would suffer seven times! Wow… no eye for eye retribution! What do we call this irrational action of God? In this little drama we see God NOT wanting a “conditional” sacrifice to please him because it negates Grace. Sacrifice I see is a human (out of the garden) concept. As we read in Isaiah God does not want sacrifice. Also in this drama we see the extent of God’s irrational love and forgiveness to Cain. Thank you for reading. Comments are welcome. The laws in the last books of Numbers may cover the “murder” of Abel, where one goes to a city of refuge. Cain was sent to the land of Nod. Was this a place of refuge? That was beautiful and spot on. Thank you. We need to be reminded often that nothing we can do will save us. That is the heresy of Pelegianism. The only thing that can save us is the blood of Jesus shed for us. Jesus is God the Son, and the only begotten Son of God. We sometimes begin to think that we are good. But that is our pride speaking; the same pride that caused Lucifer to fall; the same pride that caused Adam and Eve to believe the serpent that they could become LIKE God by their own efforts; the same pride that caused Cain to think that his produce should be a good enough sacrifice, contrary to what God had asked for. Only God is good, so any goodness that we embrace or incorporate into our being is from Him and from nowhere else, so we have no right to congratulate ourselves on our goodness or righteousness, because they are not ours, but His. Any goodness we have is a gift from God. And a gift can be taken away as readily as it is given. Thinking that we are “good” is the beginning of pride. And pride never ends well. Before the commandments were given to Moses an example was set. Cain broke the commandments of Moses. All of them. Start there. Having read the entire Holy Bible, to It’s end (Revelation 22:21) it is easy to understand this incident .First, God is the Sovereign King of the Universe. He makes choices. He chose Abel, instead of Cain, He chose Abram, out of all those living in Ur, He chose Issac over Ishmael, He chose Jacob rather than Esau. Moses, Samuel, Isaiah, Daniel, and Rav Shaul, (the Apostle Paul) on the Damascus Road (Acts 9) were all His Choices. Why did Abel merit death? Because after Adam sinned, all his offspring, including us to this day, are born sinners. We are not sinners because we sin; we sin because we are (born) sinners. (Ps.58:3) The quoted Midrashim are only guesses. The real reason, however lies in the sacrifices. Abel offered a blood sacrifice. (Lev.17:11) This was the first “type” of the future Sacrificial Atoning Death of Y’shua ha Moshiach. (Jesus the Messiah) Cain hated Abel (hate is the root of all murder) because he wanted the works of his hands to mert Salvation. God, however, would only accept a blood sacrifice, not works and later, not Law keeping. Only the Blood of Y’shua can Save one from sin. Soon He will return to earth as Messiah ben D’vid, vanquishing His (God’s) enemies and ushering in the Messianic Age. I think a lot could have happened between the two brothers preceding the death of Abel. But all that matters is that God judges as per one’s works. No wonder God warned Cain that he be on guard for sin wanted to get hold of him. I think the story is more complex than the way we see it. Sin had entered into the world and God already pronounced death as its consequent. One wonders why the first recorded death is not that of Adam or his accomplice wife, Eve. But, who can understand the ways of God? If Cain and Abel actually existed, which of course they did not. Abel was probably a self-righteous twit and deserved to get his head bashed in. I don’t necessarily disagree with your position about the the type of sacrifice, there seems to be many factors entering into this debate about just that point. I’ve tried to point out a few things in my post above yours for consideration. I think those saying God wanted a blood sacrifice are wrong; a sacrifice (korban in Hebrew, from the root meaning near) is supposed to be something near and dear to the offerer. If God just wanted a blood offering, well, Cain gave Him one, and He was not happy. I think the story is an allegory to explain the violence of humanity. A third theory: Each wanted to have the Temple of Jerusalem built in his domain. In short, the first fight in human history was also the first religious war. It is really necessary to go to the New Testament to get the best explanation for the murder & the exact location of its occurrence. It must be the case that a murder occurring between the altar & the sanctuary, as described in the Matthew & Luke gospel accounts as I’ve quoted above, occurred within an already established location practicing the temple worship practices as set forth in the Torah, this would of course be the future site of the city of Jerusalem, it therefore seems as if the third theory of midrashic literature has weighty plausibility. The picture we have from the two gospel accounts is of Abel functioning as the High Priest in the Temple at the altar in front of the Holy of Holies when he was slain. Other than the 40 years in the wilderness, the only location for the Holy of Holies & the Temple is on Mt Moriah, which seems likely to have also been the location of the Garden of Eden. It seems most likely that the reason for the rejection of Cain’s offerings was because Cain indeed was attempting to subvert the location & manner of the temple services by establishing himself in that position. God had ordained Abel to be the High Priest, a job Cain wished he had & was jealous Abel had been chosen & not himself. Now don’t forget, at the time of this incident there likely are thousands of people living having been born as mre progeny of Adam & Eve in addition to Cain & Abel, all living within the area of the former Garden of Eden & all in need for Atonement of Sin. HATE made its appearance early in man’s history. The Bible account at Genesis 4:8 says: “It came about that while they were in the field Cain proceeded to assault Abel his brother and kill him.” “And for the sake of what did he slaughter him?” asks the Bible writer John. “Because his own works were wicked, but those of his brother were righteous.” (1 John 3:12) Abel fell victim to one of the most common causes of hatred: jealousy. “The rage of an able-bodied man is jealousy,” says Proverbs 6:34. Today, jealousy over social status, wealth, resources, and other advantages continues to pit people against one another. has anybody given thought to the idea that maybe cain didn’t offer the right sacrifice? if we look into the sacrifices asked for by God at certain appointed times, then it’s not too far off to think so. most would probably argue that there was no law at that time so it can’t be so. but just as we don’t know what was said between the brothers we don’t know for certain that there was no law. all the law is is God’s instructions. so it is possible that God had instructed them on the particular sacrifice that he wanted. think also that if there was no instructions (law) how could cain’s murder of able been wrong? cain would not have known what he did was wrong if God had not told them so prior to this event. I’m with you, Sylba. That is the traditional (and all that is traditional is not wrong!) Biblical understanding. Let us stick to the Word – it is much safer, and infinitely more sensible. This article shows extreme ignorance of the Bible. Cain’s offering was not what God had required. He required a blood 0ffering because it was the same as it was during the rest of history. God was not showing preference of the brothers, but of the offering. It was not what He required..it was not a sacrifice to offer vegetables, they were just plants. Animal sacrifice was required to cover the sins of the people. I would disagree and say the author’s speculation is all wrong. Internal evidence indicates the reason for Cain was to make him the founder of civilization. He built a city and his offspring were the masters of arts and crafts. The story of the killing of Abel, like the story of Seth was a later addition to the text. Cain has the mythological role of Enki and Centaurus. He is part of the same cosmic myth as them and occupies the same spot cosmically in Centaurus, which was a larger constellation in the past. When the constellation was broken up, the Victim and Southern Cross were added. Abel became the Victim and The Southern Cross became the mark of Cain (consult midrash for what it looked like). Document hypothesis scholars agree the story of Seth was a later addition to cleanse the line to Noah by eliminating Cain who was a murderer. It seems odd that one would make Cain a murderer to begin with, the man who founded civilization and was the ancestors to the chosen people. This logic of scholars can only be taken seriously if we eliminate the murder from the original text. Then the question begs, “Why did they add it?” One could attempt to do a lot of Joseph Campbell psycho-babble as Wiesel does and offer a multiple choice quiz or accept the fact the story was astrological and changed when the constellations changed. BTW the Bible shows multiple changes (as does the midrashim) when constellations changed. I have documented them. It isn’t a multiple choice guessing game. Interesting point of view and accurate because all men came from Adam and Eve and all are thus related; so, it would be true that he who kills a man is killing his or her brother or sister. Adam and Eve had already sinned so spiritual death already was in the world and since the Messiah was yet to come salvation would be in looking forward but Cain did not look forward, he chose anger and death instead. Free will to be obedient or disobedient is the issue and the choice is yours.